Because most of the important things I’ve learned in my life can be traced back to Sesame Street. 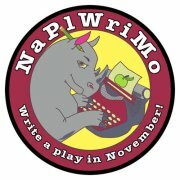 I’m doing NaPlWriMo again this year (and you should too! ), and while I do have a few ideas for full-length plays bouncing around in my head, I’m kind of at a loss of which one to start and where to begin. There’s a blog post on the site raising the question of what makes a play a play. When is something a play versus not a play? Whenever that question is raised, I always find myself back in Kate Snodgrass’s playwriting class and hear her telling us that a play, even in a format as short as ten minutes, needs to have a beginning, middle, and an end–that is, that it has to tell a full story. That conversation never fails to get this old Sesame Street song stuck in my head. It sounds pretty basic, but when you have to sit there and think about something you’ve written and make sure it has those three distinct parts, it’s actually helpful advice. One thing in particular about the ending in a play versus a tv episode or a comedy skit is that at least one of your characters has to have changed in some way. Again, sounds basic. But when I was writing The Mouse, for example, the draft that went to KCACTF had a different ending than the draft that ended up in the Boston Theatre Marathon (and published). The feedback from the judges at KCACTF was that the current version was just a skit because the protagonist had decided to quit and find a job that took her seriously. In my mind, that was a change because she went from nervous and weak in the beginning to standing up for herself and going after what she wanted. But if her walking out signified not *enough* of a change, she needed instead to pull her boss onto her side and force him to see that she was necessary (even if in his mind she’s a necessary evil). It still kills me to have had to change the original ending because I loved that version. But was it a play, or was it a sketch-comedy skit? I ultimately went with the version that left it in “play” territory. But I’m still not 100% satisfied with the ending. End: The Prayer Bargain is STILL struggling with its ending. It’s like almost all there except for the one “crystallizing moment” that ties it all together and makes the audience have that “wow, this was a good play” feeling rather than the “ok, time to get home now” feeling. Maybe if I can put into words how exactly Molly and the rest of the family change and spell out what the beginning, middle, and end is, I can get the ending to work better. Beginning: Whatever idea I decide to focus on for Naplwrimo, I don’t know where I’m going to start. The song starts off with Seymour waking up… I don’t even know who my “Seymour” will be. Why is it so hard for me to even name characters in the beginning? So there’s lots to work on. But I bought a Naplwrimo hoodie from their Cafepress store, so now I’m all geared up for writing, because I have a hoodie now, right? That makes it official. A friend on facebook (fellow local playwright Lou Johnson) posted this article earlier today: Ten Things Theaters Need to Do Right Now to Save Themselves, by Brandan Kiley in The Stranger. The article made a lot of interesting points about the problems that theatre is facing today, so I thought I’d weigh in, point by point. 1. “Enough with the Goddamned Shakespeare Already”: I love the way he puts it that fringe theatre “should be in the game of debasement.” That’s awesome. But we were just discussing this issue of Shakespeare (and other classics) at our last New Voices workshop at New Rep. I’m personally torn on this one. Obviously, as someone who makes new work, I want to see more new work in more theatres. I think it’s vital to the survival of theatre. But I also value the classics. I never got to go to the theatre as a kid, so there’s a lot of classic plays that I love that I’ve never been able to see live. New Rep is doing Long Day’s Journey into Night this spring, and I really want to try to see that because it’s one of my favorite plays and I’ve never seen it live (but I have seen the movie version). There’s so many plays I haven’t been able to see but would love to. And plays aren’t like movies, where you can pop in Gone with the Wind on dvd whenever you want so it’s not necessary to rerelease it into the theaters except for once-in-awhile special occasions. Unless we develop some sort of recording and archiving process that would make at least videotaped performances of the classics (ideally of every play) readily available, I wouldn’t want to see them totally pushed out of theatres. All that being said, yes, more new work! There should be a much better balance between new and old work in regional theatres. 2. “Tell Us Something We Don’t Know”: Again, more productions of new work! More premieres! And I like that he clarifies that even a regional premiere is a good thing. I haven’t reached this point in my career yet, but I’ve heard that it’s even harder to get a second production than it is a first production. So regional premieres that may have been done once or twice elsewhere are incredibly important. But I have to take issue with this remark: “Playwrights: Quit developing your plays into the ground with workshop after workshop after workshop—get them out there.” Don’t you think we WANT to “quit developing our plays into the ground”? No one I know wants to go through workshop after workshop without a production in sight, but often that’s just all that new writers of new work are given because that’s all the theatres have in their budgets to offer us. I don’t know anyone who’d say “no, please don’t produce me, I’d rather workshop my play into the ground until I can’t remember why I wrote it in the first place.” Seriously. It all goes back to the failing subscription-based model of revenue at regional theaters. 3. “Produce Dirty, Fast, and Often”: This I like. It’s not right for every theatre, but for small new companies that don’t have much of a budget, I think doing as much as you can with what you have can yield some really fun and surprising results. It strikes me as the type of thing that would work really well in a collaborative theatre group setting where the playwright, director, actors, and designers team up from day one and just see what they can make. Fun with no budgets! 4. “Get Them Young”: Definitely important. The question is how. New work and lower ticket prices would help, I think. But of course all of that depends on the budgets of the theatres and it’s all a vicious cycle. Maybe different models like live-streaming certain performances where people can purchase a “ticket” to view the livestream at a much cheaper price than a seat in the theatre can be thought about? That way the house can still be full but people who can’t afford the $40 or $50 it costs to be there in person would at least get a shot at seeing it. I don’t know. I think it will be exciting to see what people come up with. 5. “Offer Child Care”: I love this! Only don’t just invite actors to run it–invite the playwrights too! Everyone in the theatre would welcome the chance to make some extra money by playing theatre games with kids. 6. “Fight for Real Estate”: I’m intrigued by this concept of “artist housing.” Is this really a real thing in other cities? Although I’d personally rather just be able to make enough money to afford the cost of living. Being poor is no fun. Also, I am someone who came from from a neighborhood that was gentrified first by artsy and subsequently by rich types… artists aren’t the only ones being priced out of those communities. So are the original residents. 7. “Build Bars”: This would be fun. Last year, I went to Blood Rose Rising‘s workshop performances, and they had a little mini-open-bar in the corner that served drinks all night. And live music to accompany the performances. It was such a cool experience and gave the performance a nice community vibe. They’re offering drinks and live music again this time around as they go into full productions (Episode One opens Friday, February 17 at the Davis Square Theatre in Somerville… go see it!). 9. “Expect Poverty”: No. Just no. “Nobody deserves a living wage for having talent and a mountain of grad school debt. Sorry.” I could not disagree more. EVERYONE deserves a living wage for their work, whether they went to grad school or not. No one should have to expect poverty. Expect that it will be tough and that it’s a really difficult industry, yes. Expect that there’s no guarantee of a big paycheck like there is if you do other forms of graduate study like med school or law school, yes. But don’t expect poverty. How do you expect people to do their jobs, whether it’s making art or teaching school or working in an office, if they don’t think they deserve a liveable wage for all the work they put into it? Don’t even get me started on the fact that education costs have skyrocketed in recent years while the increase in salaries has not anywhere near matched it. I know it was meant lightly, but still. Believe that what you offer the world deserves better than poverty! 10. “Drop Out of Grad School”: Again, I disagree. MFA programs definitely are not necessary for success, and “learning by doing” is also important. The problem is, I don’t know about other people, but I had very little playwriting experience before grad school. I didn’t feel like I knew how to write a play. I didn’t know that ten-minute plays even existed. I didn’t grow up going to the theatre. And I had zero connections to the local theatrical community. I NEEDED my MFA program. And to this day I know that going to grad school was the best thing I ever could have done with my life. It’s completely changed my writing life into something that’s now a regular part of who I am instead of something I hope I can do someday. Other people might not need the MFA program in order to do that. But I did. I’m a much better writer now, I have WAY more confidence than I used to, and I actually know what the process is for trying to get your work produced now. I was pretty clueless before. So that’s it. Just my poorly organized thoughts. What I’ve been wondering about lately is how everywhere I’ve heard that the subscription-based regional theatre model is failing and needs to change. And I totally agree. But because I’m so new to this industry, I’d be interested to hear from people who’ve been here awhile about whether American theatre does really seem to be on a precipice of a major overhaul the way it was before the advent of the regional theatre, or if this is a conversation that’s been going on for decades but nothing ever seems to happen. I feel like change is necessary in order for theatre to grow and survive. Let’s do this, people.